Whole life insurance dividend options are one of the ways a whole life policy provides the policyholder robust versatility. Understanding these different options is crucial for the proper use of a dividend-paying whole life policy. The evolution of dividend options brought about by insurance company creativity creates even more flexibility and versatility of whole life insurance. Today I'll detail the four options found with just about every dividend-paying whole life policy available. I'll also spend some time detailing some more unique dividend options available at just a few insurers. These four whole life insurance dividend options did not originate at the exact same time, but their existence as options spans an extremely long time. 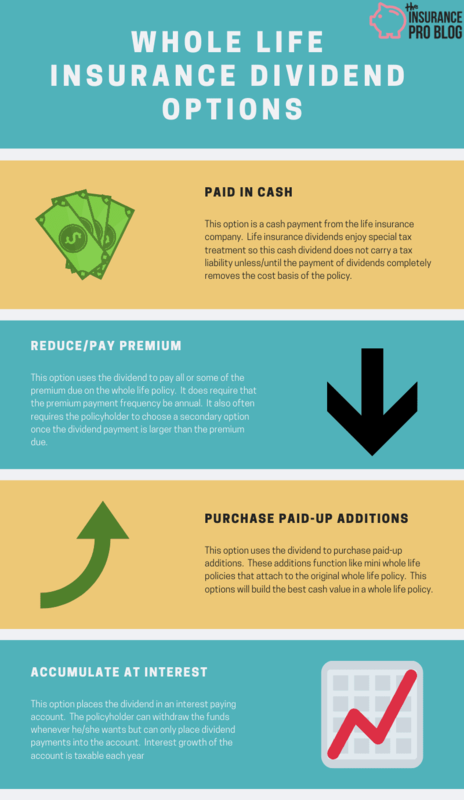 Practically ever life insurer issuing dividend-paying whole life insurance today includes these four options. The option to receive the dividend in cash is pretty self-explanatory. Each year the life insurer pays the policyholder the dividend in the form of a check. The payment comes directly to the policyholder who can then use the cash for whatever purpose he or she sees fit. U.S. Tax Code classifies the dividend payment on participating life insurance policies as a refund of premiums paid, so taking the dividend in cash does not usually cause an immediate taxable consequence to the policyholder. This is the case because the dividend paid in cash is simply reducing the tax basis established by the policyholder's payment of premiums. Eventually, however, opting for dividends paid as cash could remove the cost basis of the whole life policy. If this takes place, all dividends paid moving forward will carry income tax consequences to the policyholder. An example will help clarify this concept. Sarah owns a 10 Pay whole life policy with a cost basis of $50,000 after 10 years. She opted for the paid in cash whole life insurance dividend option. Once the insurer pays Sarah an aggregate $50,000 in dividends, Sarah will need to report all future dividends as taxable income. Also, note that if dividend payments do remove the cost basis any withdrawals from the policy will cause a tax liability as well. Policy loans continue to enjoy tax-free status so long as the policy does not violate the Modified Endowment Contract rules. Choosing to reduce or pay the premium with the dividend means the policyholder chooses to pay a part or all of the premium due with the dividend. If the dividend payment is less than the total premium due, the policyholder will need to pay the rest of the premium either with money out of pocket or with cash values from the whole life policy. It's much more common for the policyholder to pay with out-of-pocket money. Once the dividend payment equals or exceeds the premium due amount, the dividend can pay the entire premium due and the policyholder does not need to make any payment to the policy with any out-of-pocket money. It's fairly common to see older whole life policies using this option as the policyholder can keep his/her death benefit in force without having to pay the premium on the life insurance policy. Choosing this option does come with some consequences all policyholders should understand. First, the insurance company will require the policyholder to change the payment frequency to annual if it's not paid annually already. This is important for policyholders who pay premiums under some other frequency as it could cause a cash flow problem. An example will help highlight this point. Imagine that Claire owns a whole life policy with a $1,000 per month premium she pays. She decides that she wants to use the dividend option to reduce premium. In the year she makes this decision the annual dividend on her whole life policy is $3,000. The annual premium for her policy is $11,765. Choosing the reduce premium option means Claire must change her payment frequency to annual. Her dividend will reduce the premium due to $8,765, which is due in one lump sum. If Claire does not have the $8,765 to pay the premium all at once, the reduce premium dividend option is not a good idea for her. Though the dividend payment is a refund of premium, using the dividend to pay ongoing premiums due creates an offset that leaves the tax basis static in all years a policyholder uses this option. This means the cost basis will neither go up nor go down while using the dividend option to pay premiums. If the dividend is smaller than the annual premium, any payment made with out-of-pocket money will increase the cost basis of the policy. It's also worth noting that dividend payments can and do fluctuate. So if the dividend payment covers your entire premium this year, it might not next year. I bring this up because life insurance ledgers assume a constantly increasing dividend due to the assumption that the dividend scale remains static. This is not how most whole life policies work in real life. Dividends do tend to grow substantially over time, but that growth is not always absolutely linear. Lastly, know that this dividend option is somewhat unique given that there is a limit to the amount of dividend applied to this option. Once the dividend is larger than the premium due on the policy, the excess amount must go somewhere. For example, if you have a $10,000 annual premium and the dividend for the year is $12,000, you have a remaining $2,000 that cannot go towards paying the premium. In this case, the policyholder must choose a secondary dividend option. Simply, he or she will choose one of the other remaining dividend options and the $2,000 will go towards that option. The dividend option to purchase paid-up additions instructs the insurance company to take the annual dividend and purchase paid-up additions with it. Paid-up additions are mini whole life insurance policies that attach to a main whole life policy. They earn dividends themselves and have immediate cash value. This dividend option will ensure the most bang for the buck in terms of premiums generating cash surrender value. Put another way, if you seek to maximize return on premiums (i.e. the internal rate of return of a whole life policy) then the option to purchase paid-up additions is the dividend option you seek. This dividend option is also how whole life policies accumulate non-guaranteed cash value. The non-guaranteed cash value of a whole life policy is simply the cash value created through paid-up additions. Some life insurers refer to this as building “dividend additions” and will even make reference to surrendering dividend additions if the policyholder chooses to withdraw money from the policy at some point. If this is the case, understand that the terminology means the same thing. The dividend option to accumulate at interest means the insurance company places the dividend payment in an interesting bearing account and adds interest to the account each year. The insurer sets the interest rate on these accounts annually and usually, announces it with other information regarding interest rates such as loan rates, universal life interest rates, and annuity rates. If you have trouble locating these announcements, a quick call to the insurance company can answer what the current rate is. The rate can change annually, but most insurers establish a minimum guaranteed rate on these accounts. The policyholder cannot choose to place additional funds into the interest account. So for example, if a policyholder noticed that the interest rate paid on the account for the accumulate at interest option was far higher than his/her savings account, he/she would not have the option to move money from the savings account to the interest account at the insurance company. Only dividend payments can go to the account. The policyholder is free to withdraw funds from the interest account whenever he/she sees fit. But will not have the option to put the money back into the account at a later date. Once removed, the only way to build the account back up is through future dividend payments on the whole life policy. You should understand that the interest account is not part of the life insurance policy and does not benefit from the tax-friendly treatment associated with cash value life insurance. Interest earned under this dividend option incurs an income tax liability just like interest earned on any other cash equivalent account held at a bank or thrift institution. The policyholder will receive a 1099-INT at the end of the year reporting all interest paid and must file this with his/her taxes. The life insurer will not issue a policy loan against the interest account. The values accumulated can only be withdrawn. At one point in the 1980's the interest rate on these accounts grew faster than dividend interest rates and some people began using this option more to maximize interest earnings in specific years. While it's always possible we could return to a similar situation, this option usually lags the option to purchase paid-up additions in terms of overall return on premiums paid to a whole life policy. As insurers evolve and become more creative with product design a “fifth” dividend option appeared that is quite common–though not as universal as the four options mentioned above. This life insurance dividend option allows the policyholder to use the dividend to purchase term insurance. This can produce the most efficient way to acquire death benefit relative to the premium paid for whole life insurance (i.e. buying regular term insurance will still be the most efficient use of premium dollars to maximize death benefit). The significance of this option can be substantial when it comes to manipulating whole life policies with a goal to optimize cash value. In some cases, this dividend option is the mechanism for blending–but this is not always the case. This option can also come in different forms regarding the type of term insurance purchased or the way the term insurance works. In most cases, the term insurance is either One-Year Term insurance or Annually Renewable Term Insurance–not the same thing, though they might appear quite similar. For some insurers, the term insurance death benefit could be flat, reducing, or increasing. Also unique to this option, much like the option to pay whole life premiums, there's usually a limit to the amount of the dividend this option will use. Once the dividend purchases the term insurance, there could be left over dividend that must go to a different dividend option. Similar to the pay premium situation, the policyholder must choose a secondary dividend option to direct the remaining dividend. Though the life insurance industry has a reputation for being stodgy and slow to evolve, it does work quite tirelessly to innovate and bring new features and benefits to policyholders. In recent years, life insurers developed additional features for whole life dividends in an attempt to enhance policyholder value. These options are by no means universal and often exclusive or unique to just one or a few life insurers. Perhaps one of the most needed benefit option, dividend options to pay for a long term care insurance benefit attached to a whole life insurance policy greatly enhance life insurers' earlier attempt to solve this problem through accelerated death benefit options. Essentially, this option uses all or a portion of the dividend to pay for a long term care insurance policy that is attached to the whole life insurance policy. This reduces some of the high cost of long term care insurance premiums found on standard stand-alone policies but does usually sacrifice some of the benefit richness found on more traditional long term care insurance products. This option works somewhat like the option to accumulate at interest with a new twist. The dividend payment goes into an index account that earns interest tied to a stock index in much the same way indexed annuities or indexed universal life insurance earns interest. The policyholder cannot add additional funds to the indexed account but can direct all of his/her dividends to the account. The policyholder is free to withdraw money from this account at any time.